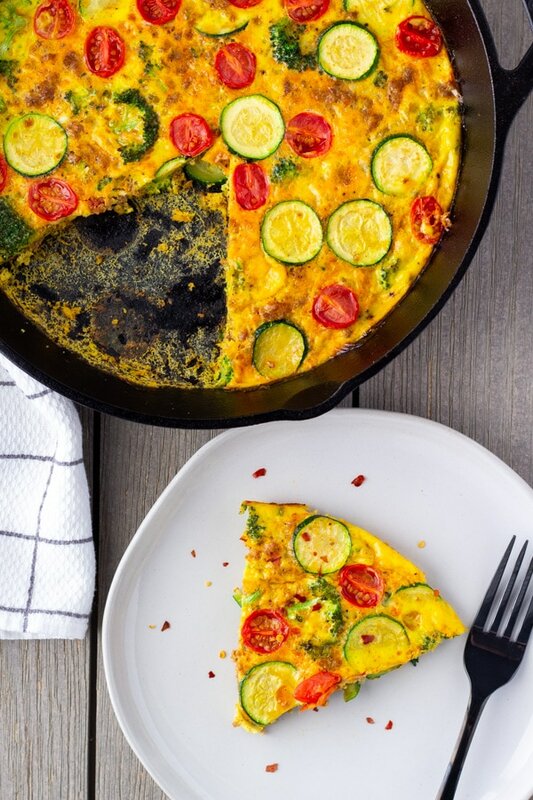 This Frittata dish is filled with ground turkey, zucchini, broccoli, and tomatoes. It’s is a great healthy start to your morning, but also makes a delicious lunch or dinner with a side salad. I tend to go through phases with my breakfast, some days I’ll have a smoothie and coffee, or days I go to the gym in the morning I’ll want a heartier breakfast with eggs. I’ve been wanting to make a frittata for breakfast, because they reheat well. If you’re like me and don’t like to batch cook a bunch a meals for the week, instead make extra food every other day and you can have leftovers for the next day. The ingredients for this frittata were basically what I had left in the fridge. I saved some turkey taco meat from a meal the other night and had these veggies leftover from other meals. 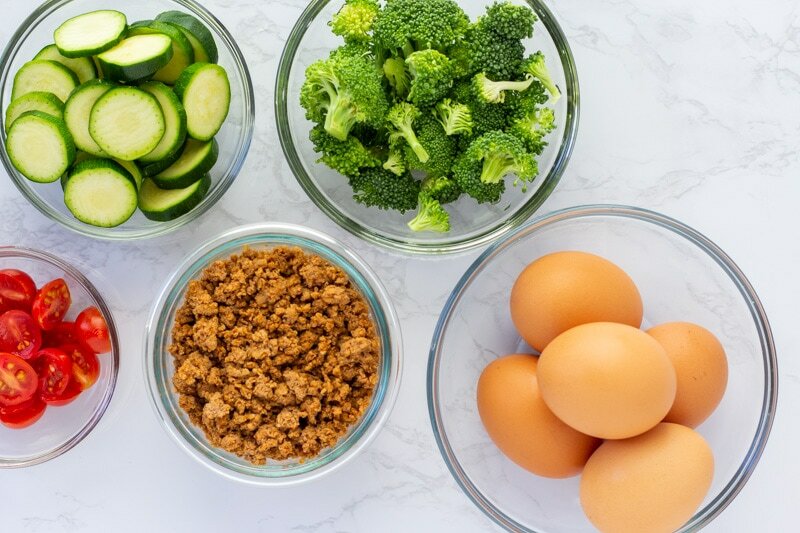 Once you have the process down on making the frittata, the filling options are endless and completely customizable to what you like. Frittatas typically have cheese either baked in or sprinkled on top, but since I was eating this, I opted for a dairy free version. Saute/cook your filling ingredients first. Otherwise if you bake them raw, the moisture will make the eggs less creamy. You can saute everything in the same pan, but if you are cooking the meat raw, then drain any excess liquid or fat. My ground turkey was already cooked. Whisk the eggs right before adding them to the frittata and quickly to incorporate air in them. Using heavy cream or half n half will result in creamier eggs, but since I wanted this to be dairy free, I used almond milk. 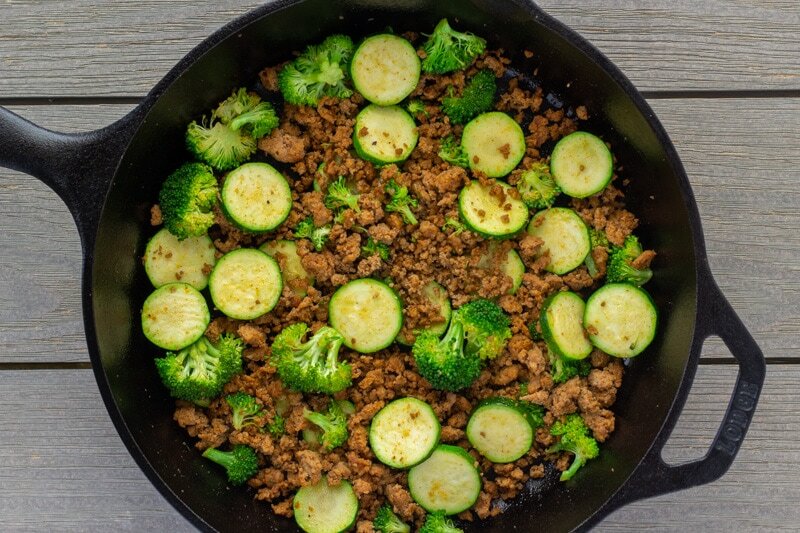 Use an oven proof skillet. I love using my cast iron skillet. If you don’t have an oven proof skillet, then you can transfer your filling to a baking dish or even a muffin tin for small portions. I sauteed the zucchini and broccoli in a little oil for about 4 min, till they got soft. After I added cooked taco ground turkey, seasoned it with a little Salt n Pepper, poured the whisk eggs, then placed halved cherry tomatoes with the seeds facing up so they don’t run into the frittata. Bake it at 350 degrees for about 15 minutes, then broil for 2-3 minutes to give the top some color. Once out of the oven, let it cool for a couple minutes, then slice into it. I sprinkled some red pepper flakes for some extra spice and it was delicious! The next day I had it for breakfast with some avocado slices and hot sauce. Next I’m going to make them in muffin tins for a grab n go breakfast! 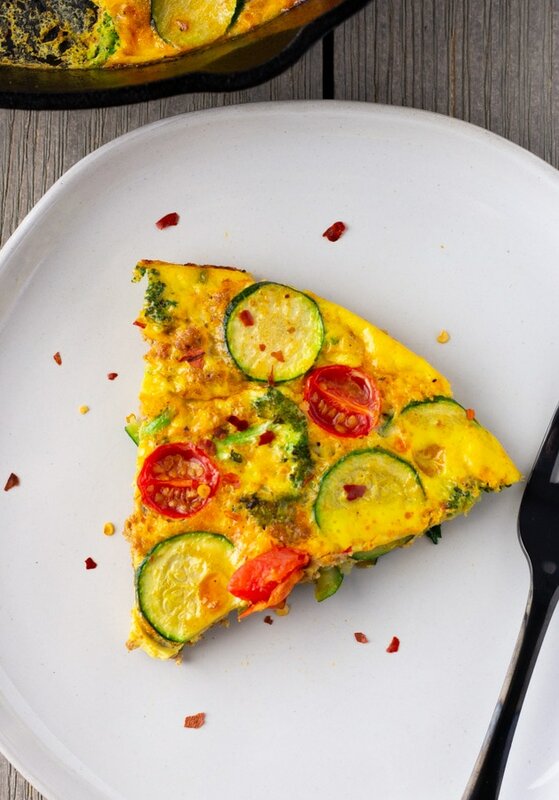 What are some of your favorite frittata combinations? 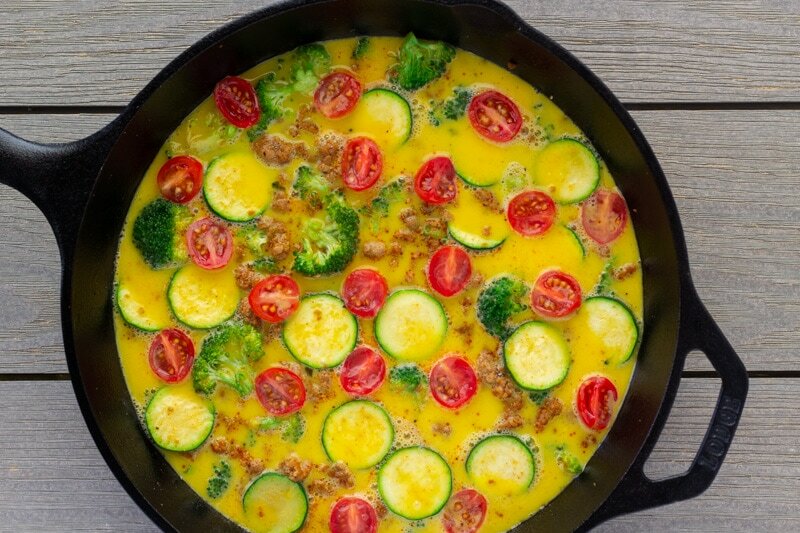 This Frittata dish is filled with ground turkey, zucchini, broccoli, and tomatoes. I made this dairy free but it can be made using regular milk as well. Heat a cast iron skillet over medium heat with oil. Saute zucchini and broccoli with some salt and pepper for a few minutes. Add in cooked ground turkey. If using raw turkey, then cook first drain any liquid, and then add in with veggies. Whisk eggs abruptly right before placing into the skillet. Add milk and some salt and pepper. Whisk again and pour into skillet. Top with halved cherry tomatoes, with the seeds facing up so they don't run into the frittata. Bake at 350 degrees for about 15 minutes, or until it puffs up. Then broil for 2-3 minutes to get some color on the top. Allow to cool a couple minutes, slice and serve for breakfast or with a side salad for lunch/dinner. If you don't have a cast iron or oven proof skillet, then saute filling per instructions and place in a baking dish or muffin tin. Top with whisked eggs, sliced tomatoes, and bake for same amount of time (15 min). I love to make frittatas for a large crowd. It is also a great way to use leftovers…thanks for this inspiration! Yes! Perfect way to use leftovers 🙂 Enjoy!